Eating raw is inherently difficult for most people. People find it too difficult, too daunting, and too time consuming. I don’t eat entirely raw by any means, especially during the winter when all I want is some soup and hot chocolate, but occasionally along comes a recipe that I can’t seem to live without. This onion bread recipe has been passed down from health doctor to doctor, and somehow our family got ahold of it. 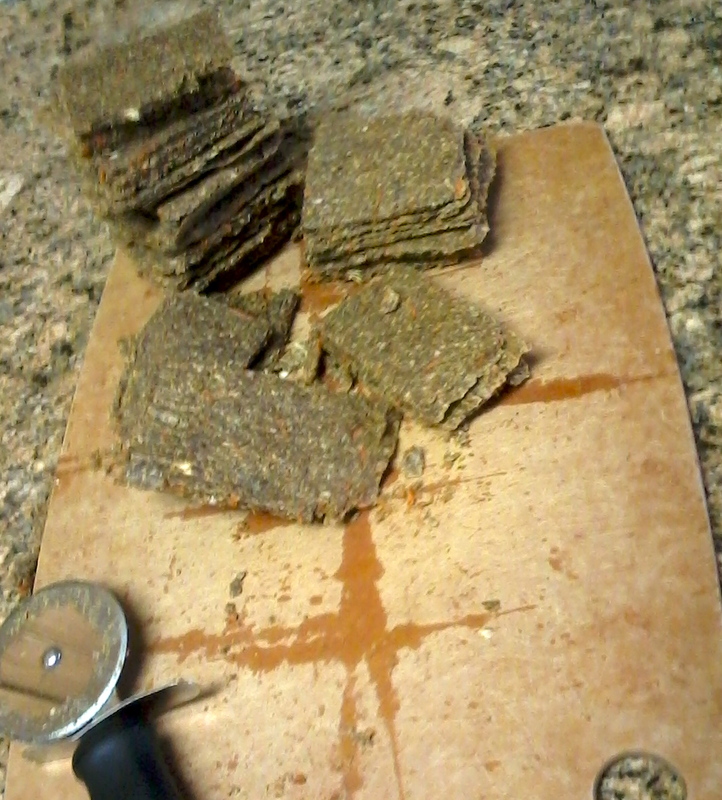 It takes a dehydrator, which some people might argue is too expensive. But having one, especially if you’re interested in eating healthy, is SO useful! 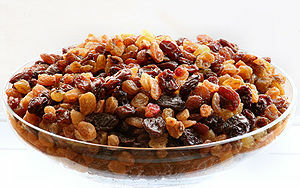 You can use it to make dried fruit out of fruit that might go bad if it sits around another day, or vegetables, or make your own healthy granola using raw honey and fruit! Kale chips and banana chips I know are super popular among health store shoppers, and would be so cheap to make yourself! All you have to do is slice up a banana and stick it on the sheet, and a few hours later – voila! The onion bread recipe is great because you can also leave it on the sheets for a couple more hours and make onion crackers – and then just cut into whatever shapes, sizes, etc. you want to eat! 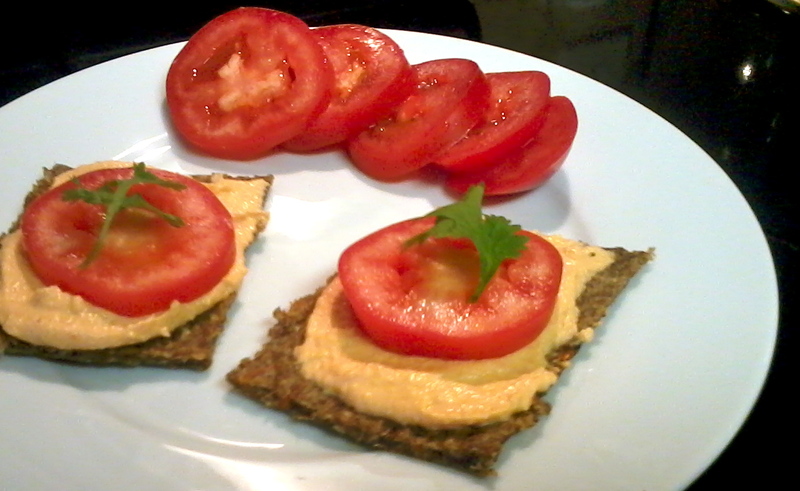 I personally love eating the onion bread pieces with raw red pepper hummus. About a day before you make the onion bread, shove 1 cup of garbanzo beans/chickpeas in a glass jar (or if I’m at school I’ve used a tupperware container! ), soak overnight, and then let sprout while your onion bread dries up (8 hours soaking, 8 hours sprouting). It’s really perfect timing if you think ahead. Typically during the summer we have this ready made every week so we can eat it up when we want something filling, nutritious and raw. I usually have onion bread, hummus, and a slice of tomato on top of each piece. If I don’t think ahead, many times I’ll buy hummus (Greek or Red pepper tends to work the best, although I’m sure it doesn’t matter) and use that instead. If I need a big meal at work, l bring these and a large salad. Now for all you haters out there, most hummus is supposed to use sprouted beans rather than canned ones. On every food show I’ve watched, Bobby Flay (or Gordon Ramsay) always lectures about it, and usually people who use cans are kicked off that episode! So anyway, try this out! 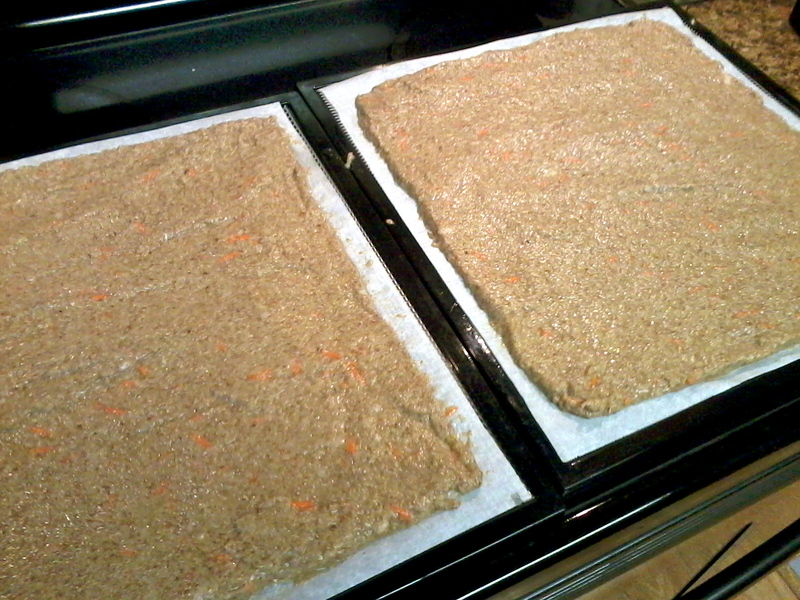 Even if you don’t have a dehydrator, you should try the hummus because that alone is amazing! If you use cold-pressed, organic olive oil, you won’t even have guilt from too much oil in your food! The bread is entirely gluten free, and grain free. 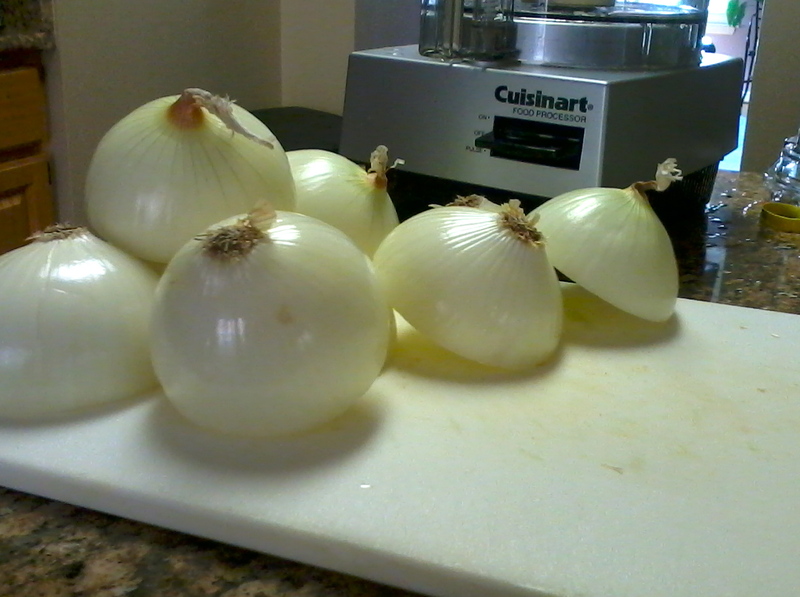 Peel and chop Vidalia onions and put into food processor - peeling and slicing in half this way helps you avoid the tears! For carrots: you can process them or buy them shredded, or shred them yourself. I personally use our processor tool for shredding which works great. Make it spread thinner for crackers. Cut with a pizza cutter. 1 cup dried garbanzo beans, soaked in a jar in purified water for 8 hours, then drained. Let sprout in container for another 8 hours. 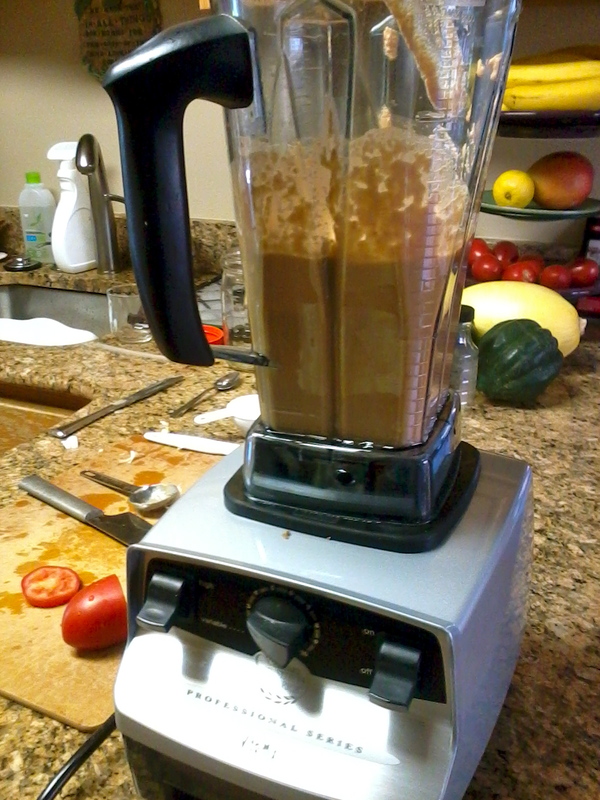 Place all ingredients in VitaMix blender (or another one that’s able to grind drier ingredients) and secure the lid. Set on lowest setting and slowly make your way to high; blend until smooth.